Bet you’re looking for the best oven roasted pulled pork recipe. This one is so simple, and takes only a pot and a few hours in the oven before you’re savoring damned fine eating. Grill season, grill season, grill season. We get it. It’s the damned Martha Brady of the meat-loving world we live in. And the truth is, it is. Grilling meat just makes it better. (Disclaimer: Most of the time). But that doesn’t mean that you need thousands of dollars in fancy grills adorning your backyard and a fancy ribbon from KCBS to be a damned good cook this summer. See, low and slow works perfectly fine in an oven too – and has for years. I wanted to create a pulled pork for those who may not have a grill, or may just not feel like standing next to it all damned day, and low and behold, I did. This is a slow braised Oven Roasted Pulled Pork, that packs all the same punch as a smoke – without the signature smoke flavor, or being outside. 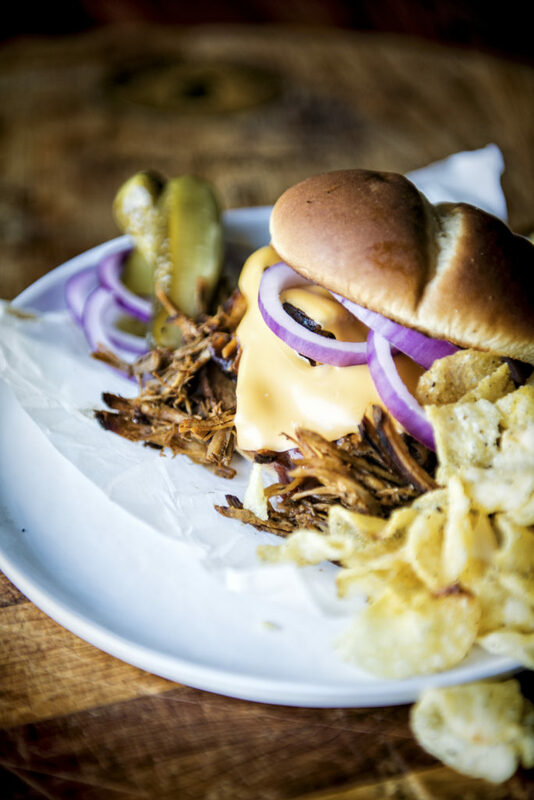 A great Dutch oven and a few minutes of prep are all you need for this pulled pork recipe. Oven Roasted Pulled Pork makes perfect fillings for quesadillas, toppings for that egg salad in the morning, sandwiches, or nibbles, if you’re admittedly lazy like me. Plus, it stores for about one week in an airtight container for reheating perfectly. Add a little more sauce, a dash of craft brew, or some broth to remoisten if heating on the stove or in a microwave (gasp!). Consider tossing it in cooking fat or broth and baking for crispy carnitas too. Pro Tip: Still want the smoke? Try adding some liquid smoke to your recipe. 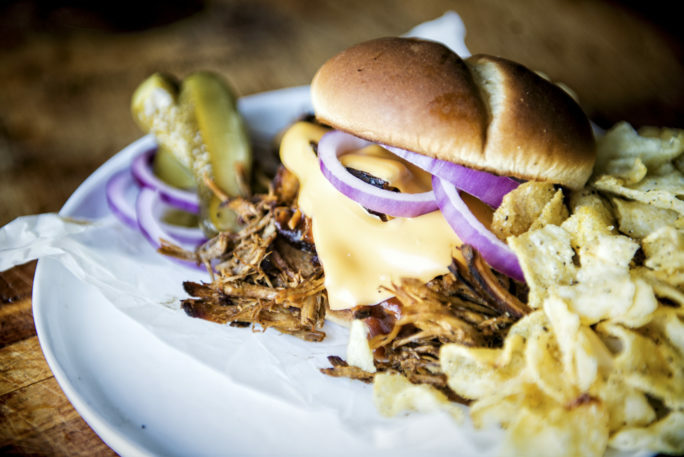 What’s your go-to pulled pork recipe? Do you smoke it every time, slow cook it, or oven braise it? Have any tips or suggestions you want to throw in? I’d love to hear your thoughts! Chime in below or shoot me a message on social with #girlcarnivore @girlcarnivore. I have a thing for pulled pork. Here are some more ways to bring it to the table that will have your family drooling! 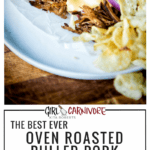 If you’ve tried my Oven Roasted Pulled Pork Recipe or any other recipe on GirlCarnivore.com please don’t forget to rate the recipe and let me know where you found it in the comments below. I get inspired by your feedback and comments! You can also FOLLOW ME on Instagram @girlcarnivore as well as on Twitter and Facebook. 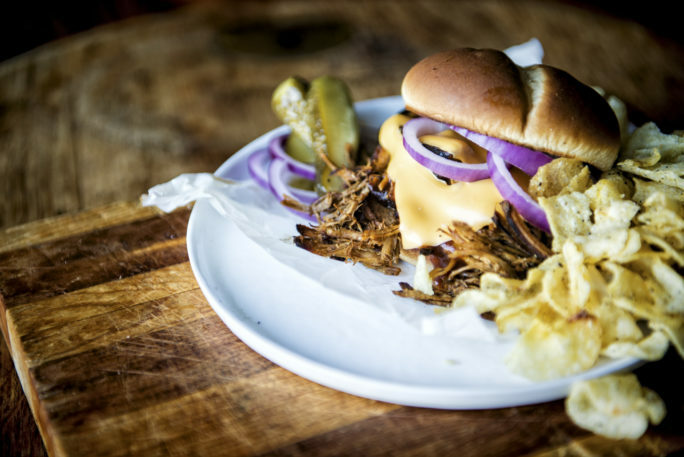 Bet you’re looking for the best pulled pork recipe. This one is so simple, and takes only a pot and a few hours in the oven before you’re savoring damned fine eating. Whisk the salt, chili powder, brown sugar, pepper, oregano, garlic powder, and ancho chili powder together in a small bowl. Remove the pork from the wrapper and pat dry. Coat with the rub. Wrap in plastic wrap and allow the pork to rest in the fridge for up to 24 hours. When ready to cook, preheat the oven to 300 degrees F. Heat the olive oil until just smoking and add the onions. Brown for 5 minutes. Add the pork and sear for 5 to 7 minutes, turning to brown on all sides. Remove from heat and add the beer. Cover and cook for 2 to 3 hours, checking once halfway through to see if more liquid is needed. Remove from oven, allow to cool until safe to handle. Shred the pork with two forks. Add barbecue sauce to coat the shredded pork and toss. Serve as shredded pork for sandwiches, tacos, quesadilla filling, nacho topping or more. I totally cheated on this recipe (because I was in a pinch for time) but wanted you to know how freaking fabulous it tasted anyway. A huge hit! I used a crock pot, didn’t sauté or brown any of it. Covered the Pork with the rub and refrigerated it over night. In the morning I quarter the onions , broke them apart, put them in the crock pot, put the seasoned Pork on top, poured the beer around the meat, covered and cooked on low 8 hours. Drained the Pork, shredded it and kept warm. Everyone made sandwiches at their leisure out of the butter grilled hamburger buns, shredded meat, BBQ sauce and hamburger pickles. Delicious. Thanks for the suggestion! My go-to recipe is slow cooked in the crockpot. Then I reduce the cooking liquid (usually root beer haha) down to a syrup which I pour over the shredded pork to be cooked under the broiler for a few minutes. And then I tend to slather it in BBQ sauce. I definitely want to try adding a rub first and browning the outsides before slow cooking though! That looks AMAZING! Thank you. I love that the beer keeps the meat super moist. Exactly what you want in a nice pulled pork! This pulled pork came out great! Thank you for the inspiration!